Over the last couple of seasons, rookie goaltenders have seemingly made a tremendous impact in the CHL. Last year, goalies such as Alex Nedeljkovic came into the Plymouth Whalers’ organization and essentially took the reins to the team’s starting goaltending duties. While Ty Edmonds‘ story differs a bit from that of Nedeljkovic’s, there is no going around the fact that the goalie stepped up tremendously for his team this season as he appeared in 55 games for the Prince George Cougars during his first full WHL campaign. Although some might look at Edmonds’ peripheral statistics and judge the goalie based on numbers alone, that wouldn’t be doing justice to a rookie goalie who faced the seventh most shots (1677) out of WHL netminders over the course of this past regular season. 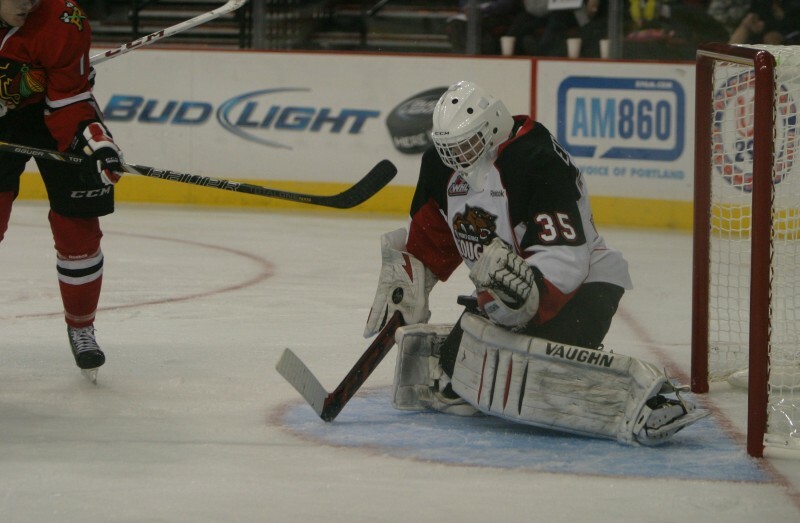 Not only did Edmonds stand tall for his team during his first WHL season, he also played well enough to earn the number eight slot in CSS’s midterm rankings for North American goalies in January. Recently, The Hockey Writers had a chance to sit down and have a conversation with Ty Edmonds about the upcoming draft and his transition to the WHL, and it is safe to say that the young netminder did not fail to impress. The Hockey Writers: Could you describe your progression from the WBAAA, MMHL, MJHL, and finally to the WHL? Ty Edmonds: Well, from 15 to 17 there was honestly a lot of change in my game as well as improvement. There’s been a lot of hard work coming from midget, then obviously playing junior A last year and moving up to the Western league this year – there has been a lot of adjustment and improvement in my game. It’s a slow and steady process, but it has definitely gotten me to where I am today. THW: What were some of the biggest learning experiences that you took away from Bantam and Midget hockey on your way to playing junior hockey in the WHL? TE: Just being on a weaker team during bantam and midget, I would be getting a lot of shots and not having a lot of highs in my game, but coming into the league it [bantam and midget] prepared me mentally. So when I’d get into tough situations or whatnot, I was prepared to deal with them from my prior experiences in my career. 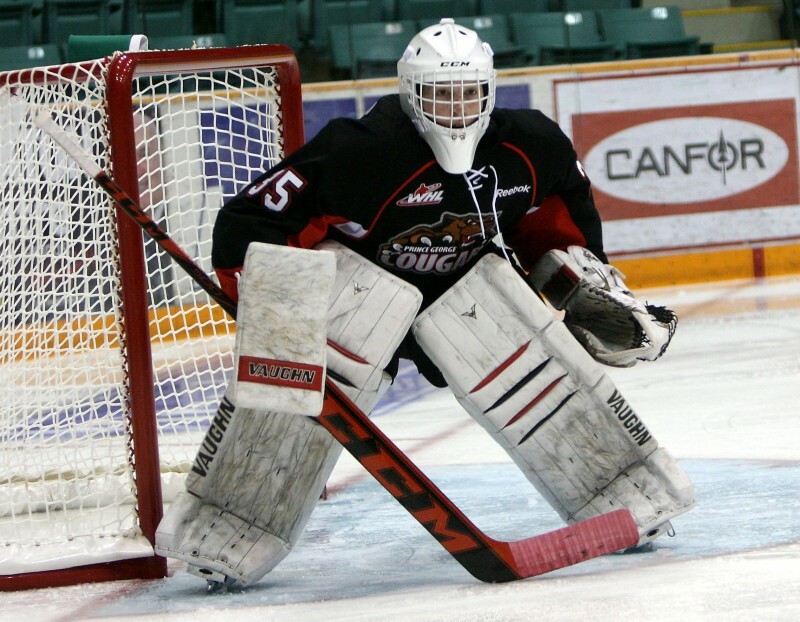 THW: What has your first year with the Prince George Cougars been like? TE: It has been tremendous. There were lots of ups and downs, but I feel like everyone experiences that throughout the league. There was a lot of personal and team success, I had a lot of fun with the teammates, and had a lot of individual success. I was happy with how my season played out – unfortunately we didn’t make it to where we wanted to be – but I feel as if I had a lot of individual success that has helped me out quite a bit. THW: You’ve played in a whopping 55 games this year for Prince George. What was the biggest transition that you had to make during the season in order to adjust to the pace of the WHL? TE: Playing in as many games as I did and as many games as there are in a season, you have to get your rest where you need it and you have to be physically and mentally prepared all the time. It’s mentally and physically draining, but you have to be prepared for every situation and just prepare the same way for every game and treat the season as one big long process. It’s not just a sprint, it’s a long marathon. THW: Has there been a particular learning experience or event that you’ve had with Prince George that has helped you build confidence with your team? TE: I wouldn’t say that there was a particular event, just being with the guys every second of the day and playing every two games with them. I don’t even know how many practices we had, but being with them [the teammates] all the time you just build confidence and chemistry with your team – you get close to them and realize that you can trust them and go out there and play for them as well as yourself. THW: What has it been like to learn from someone like Mark Holick and Justin Cardinal? TE: They’ve both been great. Mark [Holick] was obviously very hard on myself and the other teammates – which at times isn’t easy, but he gets you where you want to be, and he definitely helped me out tremendously, especially playing me the way that he did. With Justin, it’s our first season working together, but training out of the same place that he works in it has been one of those situations where he just transitions to what you’re working with before, so it makes it easy to adjust to him. THW: Could you describe your experience at the BMO CHL/NHL Top Prospects game and what you took away from that opportunity? TE: It was tremendous. I was definitely very nervous going into it with all of the skilled players there, but I definitely came out with a lot of experience and it’s not something that I will forget for a long time. THW: For teams that are scouting you for the upcoming draft, what would you say are some of the strengths of your game? TE: I would mainly say my speed and my size as well as my agility and reaction speed. The way that I play is just to battle – not too compact or moving around too much. For the most part, I would have to say that my strengths are my size, speed, and flexibility. THW: What do you believe are some areas that you would like to improve upon or fine tune before the draft? TE: Well, obviously every aspect of my game can be improved upon, but I’d like to focus on puck playing and keeping my rebounds under control. I want to get better in every aspect of my game, or at least get a little bit better in order to get me to that next level. THW: Is there a particular NHL or professional goalie that you like to watch and learn from? In terms of style of play, which NHL goalie would you say that you most closely resemble? TE: Well, I really like the way that Jonathan Quick plays. He’s not really too compact, but he’s flexible and he likes to battle hard. I’d like to say I’m similar to him, but at the same time there are obviously other goalies that I look up to like Carey Price. When I was younger – for the most part – you watched goalies like Martin Brodeur and Patrick Roy and just saw the way they battled and it’s something that you looked up to as a kid. Over the course of this past WHL season, Ty Edmonds has shown exactly why he should be considered one of the top available draft-eligible goalies available at this year’s NHL Entry Draft. Armed with good talent, athleticism, poise, and intelligence, Edmonds will certainly go into this year’s draft proceedings having received quite some attention from scouts after having a pretty impressive and hard fought first season in the “W.” While it is yet to be seen where Edmonds might be drafted or which team selects him, it is hard to ignore the fact that the netminder has a skill-set that could make him a valuable asset to any NHL team.